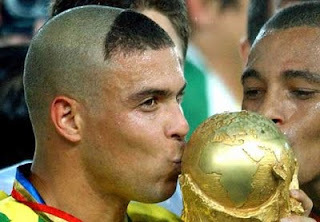 As Ronaldo took the field for Brazil for the last time, he only resembled the great footballer that he had once been. Following a career that has left his body in ruin from knee injuries and hyperthyroidism, Ronaldo was carrying the extra weight that led him to be called “Fat Ronaldo” in the later years of his career. However, the respect that the former Ballon d’Or winner commanded on the pitch from his teammates in the Selecao for the final time was unmistakable. As he entered the pitch following the bows and handshakes from Brazilian goalscorer Fred, Ronaldo did his best to make an impact on the game, but was unable to find the net despite having three opportunities set up by who many consider to be his successor, 19 year old Neymar. Despite these missed opportunities, Ronaldo remained in good spirits in his final fifteen minutes of play for Brazil. When halftime arrived he was greeted with even more applause from the Brazilian faithful and walked between the two rows of players, shaking hands with his Brazilian teammates and thanking his Romanian competitors as he exited the pitch. Ronaldo then draped himself in the Brazilian flag and took a lap around the stadium with his son, thanking the supporters for all they had done for him. It was also one last chance for those fans to thank Ronaldo for a legendary career. Ronaldo will go down in history as one of the greatest footballers of the modern era, winning nearly every honor available to him. He is second all-time in international scoring for Brazil, following only the great Pele. He achieved success at the club level with cup wins and league victories with Cruziero, PSV, and later in his career with Corinthians. The majority of his career was spent with European giants Barcelona, Inter Milan, and Real Madrid. During his tenure with those clubs he managed to win the UEFA Cup Winner’s Cup, Copa del Rey, Supercopa de Espana, the UEFA Cup with Inter in 1998, and two La Liga titles with Real Madrid in addition to the two World Cups that Ronaldo won while with Brazil. Ronaldo’s accomplishments have earned him many individual awards and he retires as one of the most decorated footballers in the modern game with two Ballon D’Or wins, three time FIFA World Player of the Year, as well as World Cup Golden Boot and Ball titles to go along with a laundry list of other awards and credentials. Besides being named one of FIFA’s top 100 players of all time and Serie A Player of the Decade, Ronaldo will also be remembered for his nearly bald hairstyle, gap toothed grin, and single finger celebrations. A player capable of incredible brilliance on the pitch, known for his blazing speed and deadly finishing, he frustrated defenses for the entirety of his career overcoming multiple knee injuries, which prematurely ended his career. He was a complete striker capable of scoring from nearly anywhere in nearly any situation whether it be free kicks, from the penalty spot, or catching opponents on the break, Ronaldo made a career of burying the opportunities he was given. He boasts an impressive score rate for Brazil scoring 62 goals in 98 appearances and at the club level he was just as impressive scoring 247 goals in 343 career appearances. The type of talent and poise that Ronaldo demonstrated on the pitch is one that will be admired by future generations and his legacy will be carried on by current members of the Brazil squad Robinho and Neymar. The images of Ronaldo draped in the Brazilian flag and raising the World Cup Trophy will never be forgotten along with all of the magical performances that he contributed over the years. Today the world is a little less bright today without the brilliance of Ronaldo’s golden boots.